Research has revealed that a chemical component called indole-3-carbinol can combat breast cancer by converting a cancer-promoting estrogen into a more protective riety. The phytochemical sulforaphane raises the levels of certain cancer-fighting enzymes that defend the body from cigarette smoke, fumes, pesticides, & other known carcinogens. Diet tips :- Broccoli leaves actually contain more beta-carotene (i.e. pre-Vitamin A) than the florets - use leaves in purees, soups, and stir-fries. To preserve broccoli’s valuable nutrients, steam or microwave, being careful not to overcook. Avoid garnishing broccoli with fatty cheeses and creams instead, squeeze on some lemon juice, or sprinkle with toasted breadcrumbs. Its plentiful store of vitamin C works as an antioxidant and may also reduce absorption of cancer-causing nitrosamines from the soil or processed foods. 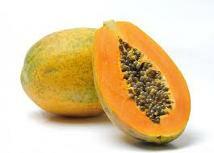 Papaya contains folacin (also known as folic acid), which has been shown to minimize cervical ysplasia and certain cancers. Diet tips :- Choose papayas that are at least half yellow in the store - fully green ones were probably picked too soon and won’t ripen properly. You can serve papaya in fruit salad, add it to a garlic-and-spinach pasta mixture, or just eat it on its own, letting the juice dribble down your arm. 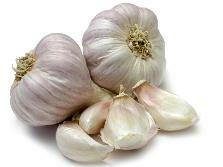 Garlic’s immune-enhancing allium compounds block carcinogens from entering cells and slow tumor development. Diallyl sulfide, a component of garlic oil, has also been shown to render carcinogens in the liver inactive. Studies have linked garlic - as well as onions, leeks, and chives - to lower risk of stomach and colon cancer. Diet tips :- Add raw garlic to salads, use it fresh in marinades and sauces, rub freshly cut garlic around the insides of salad bowls and over chicken and fish fillets. Avoid dried or powdered garlic, which is less concentrated - and less effective. Research has shown that indoles, nitrogen compounds found in kale and other leafy greens,may help stop the conversion of certain lesions to cancerous cells in estrogen-sensitive tissues. In addition, isothiocyanates, phytochemicals found in kale, are thought to suppress tumor growth and block cancer-causing substances from reaching their targets. Diet tips :- A cruciferous vegetable, kale requires quick cooking - blanching or steaming - to preserve its nutrients.When you’re done, save the nutrient-rich cooking liquid for soups or sauces. You can also use whole large leaves to wrap fillings or to layer in lasagna. This nutrient-dense food contains many anticancer properties. It’s loaded with beta-carotene, which may protect DNA in the cell nucleus from cancer-causing chemicals outside the nuclear membrane. Diet tips :- Go for freshness when picking potatoes - canned arieties contain less beta-carotene and vitamins C and B. 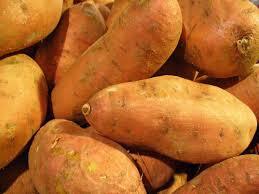 Naturally sweet and creamy, mashed sweet potatoes can be enhanced with a little apple juice. Or whip the cooked tubers with orange zest or orange juice and season with cinnamon, nutmeg and ginger. Grapefruits, like oranges and other citrus fruits, contain monoterpenes, believed to help prevent cancer by sweeping carcinogens out of the body. Some studies show that grapefruit can inhibit the proliferation of breast-cancer cells in vitro. It also contains vitamin C, beta-carotene, and folic acid. Diet tips :- Grapefruit can be sweetened with brown sugar or a drizzle of maple syrup or honey; vanilla extract, fresh mint, and almonds also accent the fruit’s flavor. Grapefruit juice will give you the antioxidants and phytochemicals that fight cancer, but it’s missing the fiber that fresh, whole grapefruit offers. Ounce for ounce, avocados also supply 60 percent more potassium than bananas and are a strong source of beta-carotene. Diet tips :- Store avocados at room temperature until they soften. If you don’t eat the fruit immediately after cutting, sprinkle on some lemon or lime juice to keep it from darkening. Add chunks or slices to salads and sandwiches or spread mashed avocado on bread. Seaweed and other sea vegetables contain beta-carotene, protein, vitamin B12, fiber, and chlorophyll, as well as chlorophylones - important fatty acids that may help in the fight against breast cancer. Also, many sea vegetables have high concentrations of the minerals potassium, calcium, magnesium, iron, and iodine. 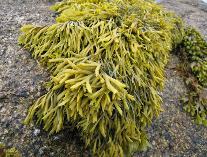 Diet tips :- Sea vegetables come fresh, dried, or powdered. Both the Japanese & the Irish regularly use them as flavorings for broths & soups, stir-fried over rice, or as a wrap for fish and other seafood. Varieties such as dulce, wakame, kombu, and hijiki even appear in pancakes, salads, puddings, and sandwiches. Soy contains several types of phytoestrogens -weak, nonsteroidal estrogens that could help prevent both breast and prostate cancer by blocking and suppressing cancerous changes. Genistein, one type of phytoestrogen, also lowers breast-cancer risk by inhibiting the growth of epithelial cells & new blood vessels that tumors require to flourish. 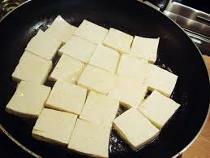 Diet tips :- Tofu is made by coagulating the protein in soybeans - much the way cheese is produced. While bland on its own, tofu absorbs other flavors when cooked, making it perfect for stir-fries, dips, spreads, shakes, even cheesecake. It’s also a good high-protein substitute for meat, whole milk, & mayonnaise. Eat plenty of fish. Fish oil helps prevent headaches. So does ginger, which reduces inflammation and pain. Salmon, tuna, mackerel and sardines actually prevent arthritis. Bananas will settle an upset stomach.Ginger will cure morning sickness and nausea. The manganese in pineapple can prevent bone fractures and osteoporosis. Women can ward off the effects of PMS with cornflakes, which help reduce depression, anxiety, and fatigue. Wheat Bran, and cabbage help maintain estrogen at healthy levels. A good antidote is beta-carotene, a form of Vitamin A found in dark green and orange vegetables. Contains chemicals that help heal both gastric and duodenal ulcers. Monounsaturated fat in avocados lowers cholesterol. Olive oil. Has been shown to lower blood pressure. Celery contains a chemical that lowers pressure, too. The chromium in broccoli and peanuts helps regulate Imbalance.